"The kitchen is growing dark. Dusk turns the window into a mirror: our reflections mingle with the rising moon as we work by the fireside in the firelight. At last, when the moon is quite high, we toss the final hull into the fire and, with joined sighs, watch it catch flame..."
Sitting by the fireside, reading of Santa's annual journey to my children, grandma's afghan draped over my lap, wafts of wassail steeping in the kitchen, visions of sugar plums dancing wildly in their droopy heads. From the likes of Clement C. Moore's "A Visit from St. Nick" to Dickens' "The Cricket on the Hearth" and Truman Capote's A Christmas Memory, a fireplace has played prominently in the ideal of a happy home. Dating back to the 1700s, Abraham Darby discovered smelting iron provided a cost efficient way of producing heat. However, it was during the Victorian era when fireplaces started gaining popularity. People of the time felt that in addition to providing heat, a fireplaces added a touch of ambiance and a cozy, quaint environment. 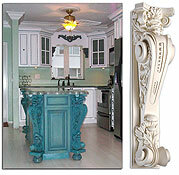 Over the years, as the style of housing changed, so did the style of fireplaces and technology. Fireplaces are more sophisticated than in the past which provides an opportunity for manufacturers to create more efficient designs from a variety of materials. Even with all the changes and advancements, the fireplace remains basically the same: consisting of two elements - the insert, and the surround which is comprised of the sides, or legs and the mantle shelf, or cap. The insert is the portion of the fireplace where the fire is burned. This part is generally constructed of cast iron and is often decorated with tile or brick. The source of heat also varies from natural wood products, natural gas sources, or chemical gels and solid chemical fuels. The type of fireplace fuel that will be used in your fireplace will have a direct influence on the material used to construct the surround and mantel. Although the material base for the insert is limited to products that are impervious to various levels of direct heat, the surround may be constructed of wood, marble, granite, or even polyurethane. For instance, in the case of this beautiful fireplace surround submitted by one of our customers in Weeki Wachee, Florida, (seriously: the only thing I like better than saying,'Weeki Wachee' is typing 'Weeki Wachee'...) he chose to use our CB-1016 Fireplace Pilasters and our CM-1007 Decorative Crown Molding to trim the mantel shelf and anchor the fireplace to the room. 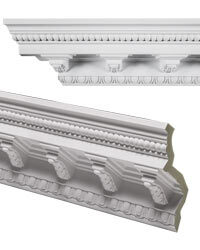 Accent the flat breastplate under your mantel with one of our intricately designed Polyurethane Ornamentals such as the ET-2832 Decorative Ornamental. This adds a little je ne sais quoi without distracting from the beauty of the rest of the fireplace. Our Decorative Polyurethane Rosette medallions make a great accompaniment to your fireplace decor. Rosettes such as our OR-5567 Rosette can be placed in various places around your fireplace surround to accent and complement your decor.